Nissan has announced Canadian pricing for the 2018 Nissan LEAF, which goes on sale in early 2018 at LEAF Certified Nissan dealers nationwide. 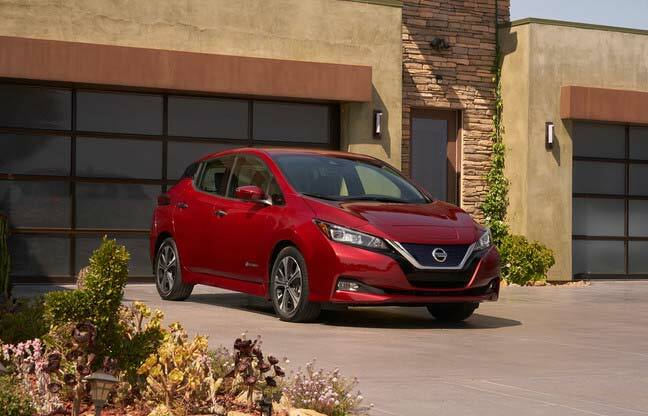 The all-new Nissan LEAF features a 241-kilometer driving range, all-new attractive exterior design, roomy high tech interior and advanced technologies including ProPILOT Assist and e-Pedal. It is the first step in the launch of Nissan’s new LEAF and will be followed in model year 2019 with a high-power version with increased motor output and battery capacity. The 2018 LEAF S starts at just $35,998. When compared to the outgoing 2017 LEAF S, it adds attractive new styling inside and out, a 40 per cent increase in driving range, a 37 percent increase in horsepower, e-Pedal and Automatic Emergency Braking. The 2018 LEAF SV grade starts at $39,598 and includes the S trim’s long list of standard features – then adds ProPILOT Assist with Intelligent Cruise Control and Steering Assist, NissanConnect with Navigation including a 178 mm (7.0″) touchscreen, NissanConnect EV Telematics, NissanConnect Services safety & security telematics, Apple CarPlay and Android Auto, Blind Spot Warning, Rear Cross Traffic Alert and 17″ alloy wheels. At the top of the range, the 2018 LEAF SL starts at $41,998 and comes standard with additional features like Leather appointed seats, Bose Premium audio system, Intelligent Around View Monitor and Driver Attention Alert.